NASA has created a new open government blog, which the space agency says should increase transparency, encourage research collaboration and enable citizen participation in NASA missions. The new blog launched last Thursday (July 28). It's part of the White House's Open Government Initiative, which requires federal agencies to create a new level of openness and accountability and provide public access to unclassified data, officials said. The new blog complements NASA's pre-existing open government website, which includes the agency's Open Government Plan and provides access to a wide range of NASA data. NASA says it's engaged in a variety of activities to advance openness and collaboration. For example, the agency is developing an open-source cloud computing platform called Nebula, which offers an easier way for NASA researchers to share large datasets with external partners and the general public, officials said. And the space agency reaches out to the public extensively via its website and through social media. 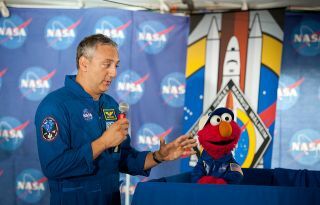 NASA TV frequently streams live coverage of NASA missions, and the agency regularly invites some of its Twitter followers to launches and other events for so-called "tweet-ups." Last year, a study of 100 governmental, political and non-profit organizations ranked NASA number 1 in terms of social-media savvy. To check out NASA's new open government blog, visit http://open.nasa.gov.